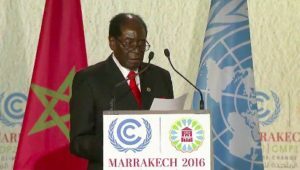 Zimbabwean President, Robert Mugabe on Tuesday, expressed concern about the water situation in his country. The southern African nation is one of those adversely affected by drought. In his words, the water situation in Zimbabwe is “dire”. Severe lack of rain across southern Africa has hit the country hard, with government officials saying a quarter of the population faces starvation. Many villagers are forced to survive on wild fruit. The government needs US$ 352 million to cater for the four million Zimbabweans in need of emergency food aid. The drought scourge is high on the agenda at UN COP22 climate talks, where world leaders and experts are discussing how to implement the landmark Paris Agreement that was signed last year. The pact aims to cap global warming at below two degrees Celsius, compared with pre-industrial levels. Posted by Pawla Nibramich on November 16, 2016. Filed under News. You can follow any responses to this entry through the RSS 2.0. You can skip to the end and leave a response. Pinging is currently not allowed.